Origin and Habitat: Scadoxus multiflorus is widespread throughout tropical Africa from Senegal to Ethiopia, to Somalia and Gambia, south to Namibia and South Africa (Transvaal, Natal); also in tropical Arabia. (Saudi Arabia, Yemen, Oman) and to the Seychelles. It is naturalized in Mexico and in the Chagos Archipelago (Indian Ocean). Altitude range: Mainly from sea level to 1200 metres above sea level. Habitat and ecology: Lowland, medium-altitude and montane grassland, woodland and open secondary forest, savanna woodland, gallery forest and coastal scrub. Scadoxus multiflorus prefers shade and is often found under trees, it is winter-dormant and flowers in early summer. Butterflies are among the few insects that have the ability to see red, a characteristic that they share with birds and mammals. The orange or red flowers of Scadoxus multiflonts, are perfectly adapted to attract these beautiful insects. Their large clusters of funnel-shaped flowers secrete energy-rich nectar at the base of the floral tube where it is accessible only to the siphon-like mouth parts of butterflies. 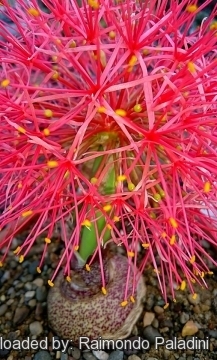 Haemanthus cruentatus Schumach. & Thonn. Haemanthus tenuiflorus var. delagoensis (Herb.) Herb. Haemanthus tenuiflorus var. coccineus Hook.f. Haemanthus tenuiflorus var. mocambicensis Herb. Norweg. J. Bot. 23: 64 (1976). Description: Scadoxus multiflorus (Martyn)Raf. 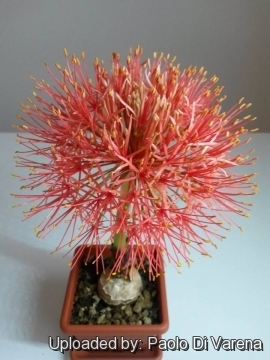 (formerly Haemanthus multiflorus Martyn) is a popular deciduous, geophyte, bulb variable in height (15 to 120 cm). The purple- spotted inflorescence stalk is up to 40 cm high and bears an Allium-like spherical head, up to 15 cm diameter with numeros starry red threadlike flowers. The flowers are frequented by a range of insects, particularly butterflies. The long, strap-shaped leaves up to 35 cm long appear with, or shortly after, the flowers. There are three recognized subspecies. Bulb: Rhizomatous , i.e. a bulb which also produces rhizomes (thickened roots). Leaves: Leaves developing after the inflorescence elliptic-lanceolate to 35 cm long with wavy margins and distinct midribs. The bases of the leaves, the stalks or petioles, are tightly wrapped together to form a pseudostem or false stem, 5–60 cm long. Flowers: The flowers are borne on a fleshy, leafless, stem (scape) up to 12-75 cm tall, pale green often mottles with reddish-purple; in the form of a spherical dense umbel of 10 to 200 individual red starry flowers resembling powder puffs. Both the pseudostem and the scape are often covered with reddish brown to dark violet spots. The involucral bracts under the umbel soon withering, lanceolate to linear, up to 6 cm. long and less than 1.5 cm. broad, colourless or tinged with red. 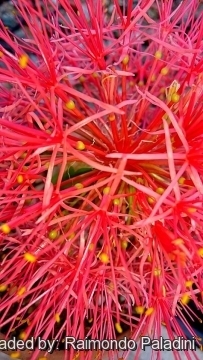 Each flower with 6 filamentous perianth segments (tepals) , scarlet with 6 pink stamens. Pedicel (flower stalk) 15–45 mm long. The tepals, filaments of the stamens and the style are all scarlet, fading to pink. The bases of the tepals are fused to form a cylinder-shaped tube, 4–26 mm long; the free ends of the tepals are long and narrow12–32 mm, 0.5–5 mm. broad, (1–)3(–5)-nerved and spreading. Filaments filiform, 1.5–4.2 cm long at anthesis. Anthers 1–3 mm, red or yellow. Blooming season: Summer after the break of the first rains. Fruit (berry): Bright orange 5-10 mm across. ***Chromosome number: 2n = 18. Scadoxus multiflorus (Martyn) Raf. : (subsp. multiflorus) Flower tube 4–15 mm, segments 12–32 x 0.5–2.5 mm, height variable. Distribution: Southern to tropical Africa; Arabia. Scadoxus multiflorus subs. katharinae (Baker) Friis & Nordal: Flower tube 12–22 mm, segments 18–30 x 2.2–4 mm, height up to 120 cm. Distribution: Swaziland; eastern coastal South Africa. Scadoxus multiflorus subs. longitubus (C.H.Wright) Friis & Nordal: Flower tube 15–26 mm, segments 15–28 x 1.4–3.4 mm, height up to 65 cm. Distribution: Lowland forest in tropical west Africa. Notes: Scadoxus species were formerly included in the related genus Haemanthus (which has distichous leaves without midribs), moreover Haemanthus species are southern in distribution, form true bulbs and have 2n = 16 chromosomes, whereas Scadoxus species, such as S. multiflorus, are found throughout tropical Africa, do not all form bulbs and have 2n = 18 chromosomes. The leaves have a further distinguishing characteristic: those of Scadoxus are thinner and have a distinct stalk (petiole); those of Haemanthus are thicker and without a petiole. 10) Neuwinger, H.D., “African Ethnobotany, Poisons and Drugs”, Chapman & Hall. 16) “Scadoxus multiflorus (Martyn) Raf.” In: eMonocot.An online resource for monocot plants. Retrieved on 22 January 2016. from <http://e-monocot.org>. 20) Wikipedia contributors. "Scadoxus multiflorus." Wikipedia, The Free Encyclopedia. Wikipedia, The Free Encyclopedia, 14 Aug. 2015. Web. 22 Jan. 2016. 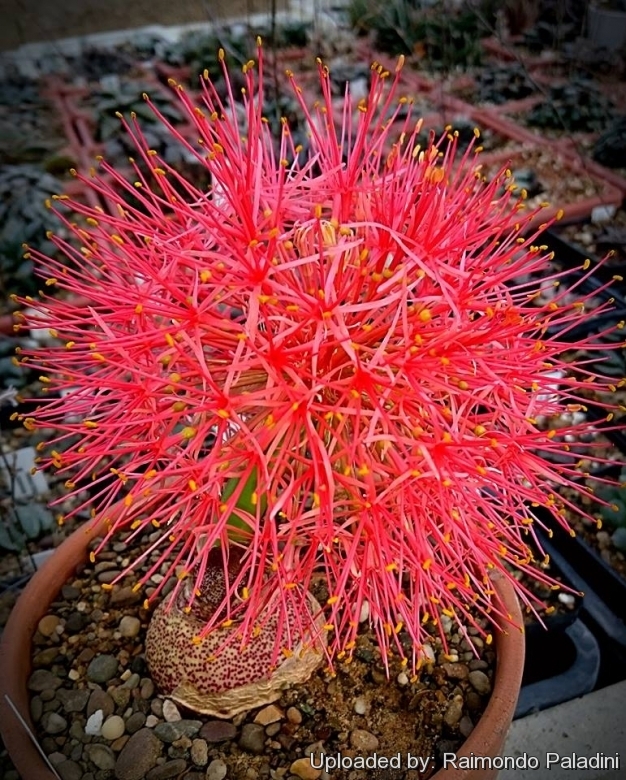 Cultivation and Propagation: Scadoxus multiflorus is grown as an ornamental plant for its brilliantly coloured flowers, either in containers or in the ground in where the climate is suitable. This species is winter-dormant, not frost-hardy and must be kept at a minimum temperature of 10°C. Soil: Open, well-drained growing medium, largely organic and well-drained. Water requirements: It enjoys moisture in a well-drained situation. Pests and diseases:* Slugs and snails can make holes in the foliage if not controlled, and root-knot nematodes may stunt the plant's growth. Hardimess: USDA Plant Hardiness Zones 9 and 11, to Zone 8 with winter protection. Traditional uses: Strongly toxic like other Scadoxus species, it has been used as a component of arrow poisons and fishing poisons, as well as in traditional medicine. In southern Malawi the roots of the herb are pounded and the powder rubbed into incisions as a cure for backache. The roots are also used as a dressing for ulcers and for vaginal infections. Said to be used as a remedy for the ailment, but it is well to note that the bulb is poisonous both to humans and animals. Warnings:* It contains Boophane, poisonous alkaloids that cause vomiting and gastroenteritis, and possibly death due to heart failure. Propagation: It is by seed.